For its sequel, Techland is changing tweaking, upgrading, and writing whole new systems into Dying Light 2. 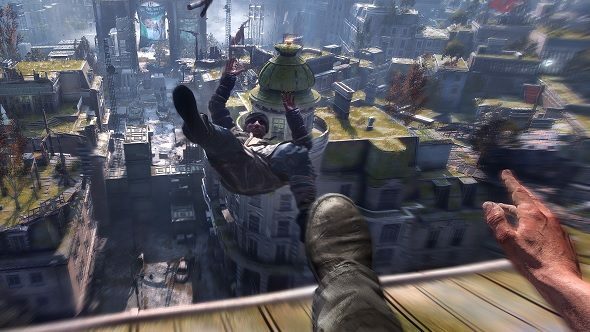 A city that changes to reflect the decisions you make in the story is the headline sell of Techland’s new game but also of real importance for fans of the first game is the news that it will feature double the parkour moves of the original. These new moves should give you much greater mobility when moving around the city of Dying Light 2. The news came from Tymon Smektala, lead designer on Dying Light 2, while speaking on YouTube Gaming’s post-show stream. Check out our hub page for a comprehensive run down of everything from E3 2018. Smektala also said that first-person combat would be more tactical than the previous game – pushing you to constantly move, observe your enemies so you can respond to their actions, and look out for parts of the environment that can be interacted with to give you an advantage in combat. The day/night cycle that was central to the original has also been given a revamp, apparently. Creating new situations in which you are forced to head into the night and face the enemies hiding there. “This is a bold sequel for us,” Smektala says. Pointing out that it is a huge departure from the already ambitious original.